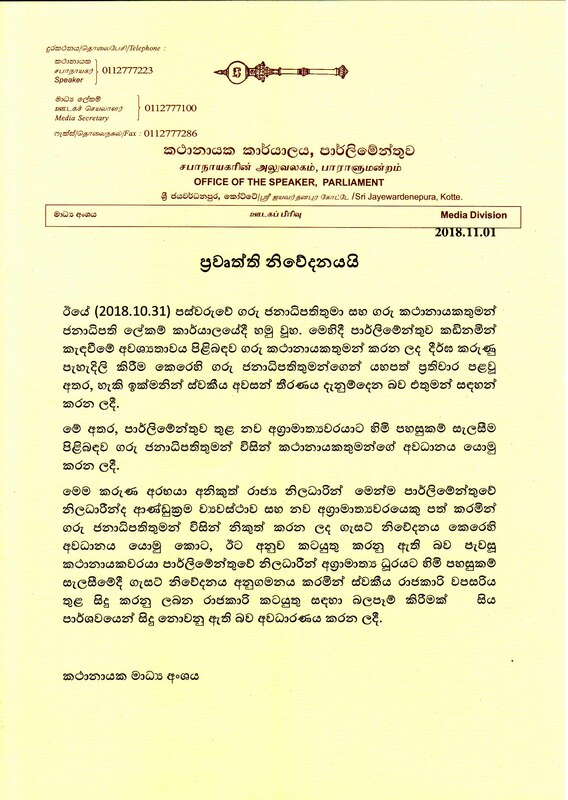 Nov 01, 2018 (LBO) – Sri Lanka’s Parliament will be reconvened on Monday as earlier scheduled, quoting the President, Prime Minister Mahinda Rajapaksa said. The date was earlier fixed for the second reading of the Appropriation Bill (Budget Speech) which may use by the new government to present the vote-on-account instead of a full budget. President Maithripala Sirisena has told the Speaker Karu Jayasuriya yesterday that necessary measures will be taken to reconvene the parliament and it will be announced in due course. The President has also called on the Speaker to provide required facilities for the new Prime Minister and the government. The President by virtue of the powers vested in him by Article 70 of the Constitution prorogued Parliament with effect from 27 October 2018 and fixed 16 November 2018 as the date for commencement of the next session of the Eighth Parliament.